Christmas decorating is fun, but for me can be rather nerve wracking. I never feel I have it just right, and I usually spend many days tweaking or rearranging things that I have created. However, my light fixture ornamentation is easy. 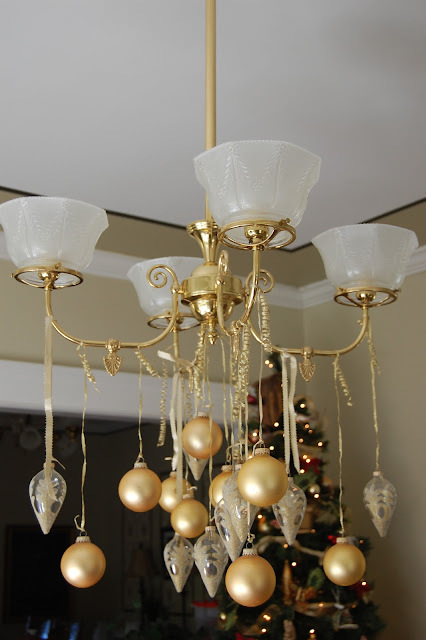 I simply tie gold ornaments on the light fixture using wired ribbon. Then I curl the ends of the ribbon with a pencil. There is no precision, fluffing or tweaking with this easy Christmas decoration! Do you have any easy Christmas decorating tips? I would love to hear your ideas! I have a light fixture that gets the same makeover. It's so easy and adds some flair to holiday dining. I love seeing everyone's holiday decorations right now. I've been lurking on so many blogs. It's addictive. This is very pretty! And looks very easy! Thanks for visiting my blog and your nice comments. I am eager to look around your blog as well! LOVE the fact that you use wired ribbon! i have done this before but always thought the tied ends looked goofy. time to give it another try! your xmas tree is beautiful! i do about the same as you do on my light. That looks so lovely! I'd copy you in a heartbeat if all of my fixtures weren't also ceiling fans! Heather my friend, for this project no tweaking is necessary! It's beautiful! I had some catching up to do on your blog ~ oops, I thought I was already a follower. I'm just like you...I tweak and tweak all the time. Love this idea. Looks beautiful. Thanks for sharing. Happy December. Such a great idea to spruce up the dining table. I am always at a loss for what to do to add a little more holiday cheer!